According to Tremblay, to achieve this goal, it’s all about providing a customer-centric solution and asking the important questions: what types of issues are they experiencing? How can we solve their problems? How can we provide a complete solution while accommodating each customer’s needs? The answer: scalable and modular equipment. When it comes to collaboration, Rheinmetall is all about pooling expertise. “We are always happy to foster relationships with other companies and bring on their wisdom and know-how,” said Tremblay. “Collaborating with BAE Systems and the Broadsword® Spine® is a great example of how we are able to integrate with nearly any type of equipment. Their smart vest, with our Argus system imbedded, provides a high-tech bespoke system for the end user. Another partnership, this time with Ultra Electronics, has brought Ultra Lynx to life: a Soldier Worn Power Data system that aims to take the headache out of power management, effectively optimizing the system without adding any extra battery weight. Remember – the average warfighter carries at least 36 kilograms, so each addition of weight to their physical burden needs to be backed up by an exceptional value proposition. “We need to be able to power any product so we can continue to improve on the system,” said Tremblay, “from Micro UAV’s to specific MDE’s. 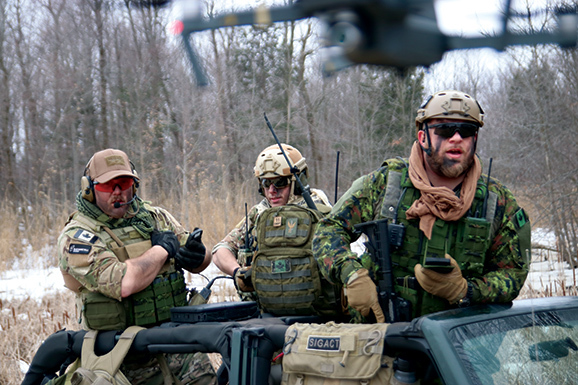 “To accomplish such streamlined communication, we needed to integrate BTA, create the ability to paint a target, facilitate compatibility with different radio transmission feeds, and build a unified network with our software,” said Tremblay. “This allows every soldier to be part of server-supported situational awareness in the battlefield. Information is power in the battle space, according to Tremblay. From a single soldier to artillery to air power, being part of the same chain of command requires a no-fail communications system. “By keeping the important players connected, we hope to help eradicate blue on blue fatalities. The next-generation Argus soldier system gives the user an unparalleled capacity for communication and mission readiness, wrapped up in one lightweight, ergonomic package. And no matter what kinds of challenges the modern soldier will face on the battlefield, Rheinmetall’s future-proof technology is sure to stand the test of time.